Space Music: How To Hear Solar Flares From The Moon : The Two-Way Space weather can be heard, in a sense, by tuning in to CRaTER Radio, a "sonification" project that uses data from a NASA lunar orbiter to generate musical sounds. The results are then streamed onto the Internet. Live, from the moon, it's the space weather report: Data from a lunar orbiter is being used to create a music stream that reflects conditions in space. 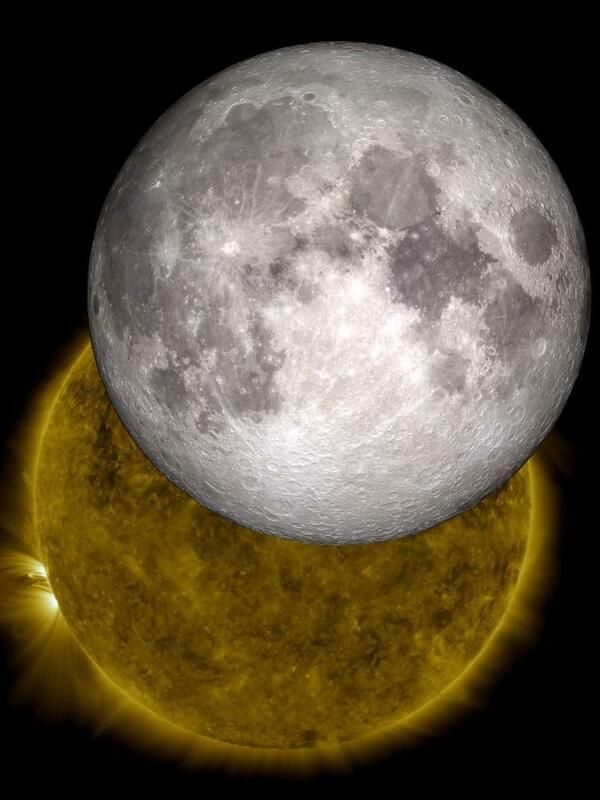 Here, an image created by NASA "visualizers" who used data from 2010 to show the moon traveling across the sun, as happens two or three times a year. We've been following the coronal mass ejection that headed toward Earth after an intense solar flare was emitted from the sun earlier this week. And now NASA tells us that such events can be heard, in a sense, by tuning in to CRaTER Radio, a "sonification" project that uses data from NASA's Lunar Reconnaissance Orbiter to generate musical sounds and stream them on the Internet. The CRaTER streaming radio station essentially gives a weather report by playing samples of instruments in various keys and pitches, interpreting conditions in space by a set of established rules. The musical instruments range from a piano to a banjo. The raw data comes from six different detectors on the spacecraft — so in a sense, it's like hearing a sextet from space. "Our minds love music, so this offers a pleasurable way to interface with the data," Marty Quinn of the University of New Hampshire, Durham, who led the music project, says in a NASA post today. "It also provides accessibility for people with visual impairments." iPhone: Send your browser to the streaming .pls URL. Android and iPhone: The (free) Shoutcast App: click on stations, and search for Crater. From a desktop: Click for a Windows Media Player .asx URL. The rules that govern the sounds are a bit complicated, at least to our eyes (and ears). At a basic level, the CRaTER Radio site says, "when few cosmic rays are hitting the detectors the music will be in a major scale. As counts increase, the music becomes more and more minor." The radio stream is always in live mode unless the orbiter is behind the moon. If that's the case, it uses special cues to pass along that information, as well. "At the lowest radiation levels, the main instrument will be a piano, playing pitches from one of the major scales. But as the peak radiation level climbs, one of the minor scales will be selected instead, and the piano will be replaced by one of seven other instruments. "For example, when CRaTER picked up elevated radiation counts caused by the solar flare on Jan. 7, 2014, the primary instrument changed to a marimba, which is two instruments up from the piano. A steel drum or guitar instead of a marimba would mean the radiation level had ramped up more. A banjo would mean the peak had climbed to the top of the normal operating range." Our apologies go out to anyone who thought that hearing a Space Weather Report would involve a dreamy mashup of "out there" jazz from musicians Sun Ra (of "Space Is the Place" fame) and Wayne Shorter and Joe Zawinul (who led the Weather Report).